Ospreys centre Jonathan Spratt says the region are not giving up on a place in the Pro12 play-offs. The Welsh region are fifth in the table, four points behind fourth-placed Glasgow, who have a game in hand. They face Newport Gwent Dragons at Millennium Stadium on Sunday hoping to follow up Friday's 25-19 win over Leinster. "Hopefully with the run in we've got, we can put a little bit of pressure on the teams above us," said Spratt. The 10th-placed Dragons meanwhile will be hoping to put in an improved performance against their Welsh rivals. Lyn Jones' side suffered a 45-27 thrashing at second-from-bottom Treviso in their last game. 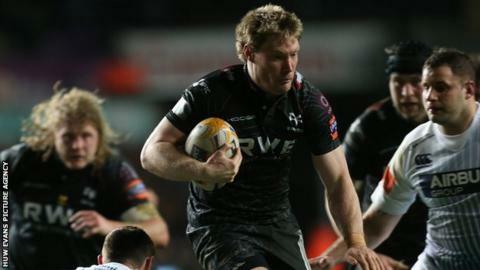 Despite both teams' differing form, Spratt says the Ospreys will not take the Dragons lightly. "I'm sure they [Dragons] will be looking to bounce back from that," said Spratt. "What we are trying to strive for now is trying to get into that semi-final play-off position. "Hopefully we can take some of that momentum we had from [the win against Leinster] and take it into the game against the Dragons." The match at the home of Welsh rugby is part of a double header involving the four Welsh regions with Cardiff Blues taking on Scarlets in the earlier kick-off. Spratt says the fact it is a derby will add an extra edge to the occasion. "With local derbies it always has that [bit of] little spice," said Spratt. "It does always adds that little bit extra. "We are quite familiar with the teams that we play against. Us having the Dragons and obviously coached by Lyn who's previously been at the Ospreys, we know what we are up against. "They've got some real game changers as well, with Taulupe Faletau [and] Jason Tovey and then they've got a very youthful team with a few old heads added in the mix as well."